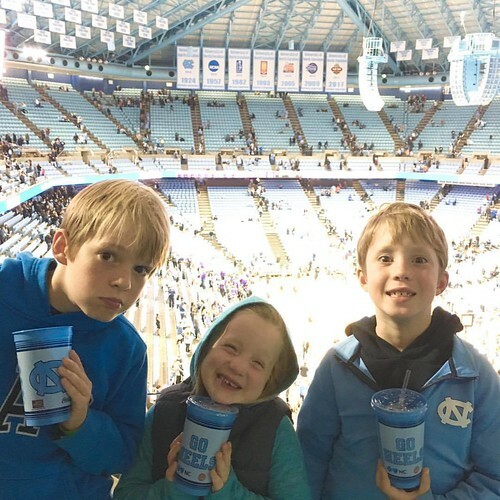 Last Friday, we went to the Tar Heels' home opener. It was the first time all five of us were in the Dean Dome together--and Lauren's first time ever. The kids delighted in every aspect of the experience: riding the shuttle from the Friday Center, climbing all the way up to our seats, drinking soda, cheering as the starting lineups were announced, rooting for the Heels (who won easily over Northern Iowa), and even hearing a favorite Bruno Mars song played by the band. No one really even complained when we had to wait for nearly 30 minutes in 40-degree weather for our shuttle back to our parking lot. In fact, Lauren and Evan spent the time running around in a grassy area, playing tag. It was a treat to be out past 9:00 without feeling like the world would fall apart. 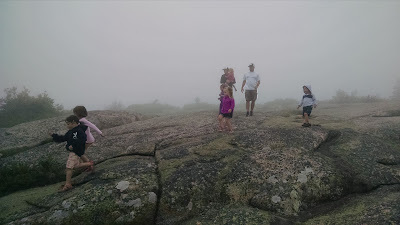 Once again, I find myself grateful for this season in our family life. Life moves quickly, and my babies aren't as easy to scoop up and snuggle. Their personalities are familiar and also emerging/ shifting as they learn more about themselves and the world. And, increasingly, it feels more like we're experiencing life together--rather than us leading and them, following. I know there will be growing pains, but I hope they know that Matt and I are here, ready to comfort them and celebrate with them, whatever their "growing up" brings. I'm thankful for the fun we have together and the love we share. And I'm grateful that even our youngest is able to tag along on later nights--and for the nap she could be persuaded to take earlier that afternoon.